Corporate Audio Visual Services provided support for the Jazz Foundation of America's sixth Annual "A Great Night in Harlem" gala fundraiser.As the Jazz Foundation of America prepared to host its 6th Annual "A Great Night in Harlem" gala fundraiser for over 400 guests, its event planner, Carol-Ann Ross of Swag Events in Manhattan faced a big challenge. Her limited production budget of $30,000-35,000 had to cover lighting, sound, and visuals for a 40 x 100 foot tent erected in a schoolyard across the street from the Apollo Theater. Ross contacted Joe Guilderson of Corporate Audio Visual Services (CAVS) with the hope that he and his staff could create the right ambiance at the right price. "We focused first on tent lighting for the dinner and after-party since Ms. Ross expressed that the lighting had to wow the guests with the atmosphere of a vintage jazz club," explains Ed Morrell, CAVS project manager for the event. "Our job was complicated by the fact that the dinner began while it still was light outside but the after-party took place when it was dark. Ross chose Altman Lighting to supply most of the lighting needs for this event. Lighting was designed using a lighting program called WYSIWIG that allows the lighting designer to program intelligent lighting in a virtual setting. The program generates all relevant paper work (dimming and channel assignments) and helps to greatly reduce the amount of programming time on site. Using a series of Intelebeams allowed us to easily change from dinner look to after-party look without much focus time and also cut down on labor for installation. To stay within the budget, we chose a lighting design that could do double duty." Morrell and his technicians, production coordinator Monica Moss and lighting designer Ray Wsolek, lit the tent with 20 Altman SpectraPAR low heat, low voltage lights that provided high output lighting and a multi-color luminaire around the perimeter. These were focused on the ceiling in different combinations of ambers and blues. The lighting team spent two weeks prior to the event programming the different lighting sequences, for dinner, the walkout from the tent into the Apollo, the gala presentations, and the after-party into a Hog iPC with Hog 3PC software. "The SpectraPARs saved the client money because of their versatility. We didn't need different lights for each part of the event," notes Morrell. Adding to the dramatic appearance inside the tent were Par 56 cans to uplight posters on the walls, three-inch Par pin spotlights on each table, and six programmable Intelebeam lights projecting GOBO designs on the floor, ceiling, and walls. Two of the Intelebeams also were used as podium spotlights during the presentations and awards. CAVS handled video for the event as well. "The eaves of the tent were only 10 feet high so we were limited to using Da-Lite 6 x 8 foot deluxe screens, one of each side of the stage," says Morrell. "We ground supported the screen, omitting the front legs and valance, and dressed the bottom and sides with stretch fabric and duvetyn to make it look like part of the tent wall. We went with four Sanyo XF-30 projectors, two on each screen converged, to enhance and increase the visibility of the slide show of sponsor logos and the live camera images of the awards ceremony during the relatively bright late afternoon hours." The team chose IMAG to make sure that everyone in the audience experienced the intimacy of the awards and speeches. A Great Night in Harlem required a sophisticated audio system for its high-profile musicians that included the Original New Orleans Liberty Brass Band, the Duke Ellington Orchestra, percussionists Candido and Roy Haynes, and bandleader and keyboardist Paul Shaffer. Morrell, along with his A-1 audio engineer, designed the sound utilizing Apogee AE-5 and AE-3 speaker systems and processing. An Allen and Heath GL-4 24/8 provided the mix for both FOH and monitors. An array of Beta 58, SM 57, AKG 451, and Shure UHF wireless systems were used for the performances. Shure MX418 podium mics were used for award speeches. "The concert performers needed the right acoustic environment but with an invisible audio package. We placed speakers along the lip of the stage as front fills and spread the AE-5s left and right of the stage and further out to provide point source audio and create a subtle sound that could be heard by everyone in the tent at equal levels. Jazz is a very spontaneous art and in order for the musicians to hear each other well, we placed as many monitors as possible on stage. Our team chose KT EQ's to control levels of feedback both in FOH and in the stage mix so that the audio could be adapted to the spontaneity of the evening and the changing array of musicians on stage at any time." CAVS also constructed a stage and set up an elegant Lucite podium for the awards. Lucite allowed light to pass through and maintained the flow of the room's ambiance. It also provided a lower profile that did not conflict with the baby grand piano, full drum kit, keyboard, bass and guitar on stage. Crystal Vision stretch fabrics were placed strategically around the perimeter of the tent to add a design element to the set. These translucent fabric triangles filtered different shades and colors of light from the Par 46 lighting fixtures placed behind them. "The tent was one of the most beautiful tents that I've ever seen at an event," says Ross. 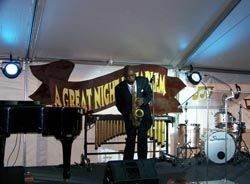 "Everyone loved the event, the Jazz Foundation of America raised over $1 million to aid the Jazz Foundation of America in its service of jazz musicians in need, and we plan to do a similar gala in the same location next year." For more information visit www.corporate-av.com.